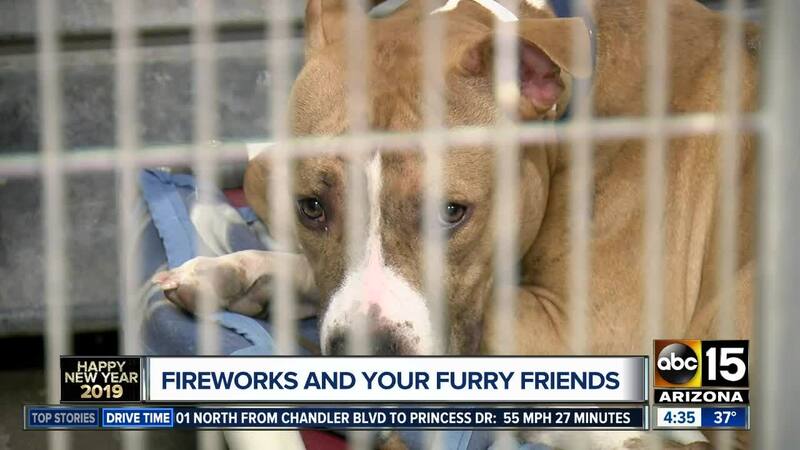 PHOENIX — Unlike any cocktail you may be mixing on New Year's Eve, fireworks and pets do not go together. While you may be celebrating, each explosion in the sky will make for a scary start to 2019 for your furry friends. "We've heard of dogs jumping over fences ... crawling under fences," said Jose Santiago with the Maricopa County Animal Care and Control in Arizona. "We've heard of dogs jumping through windows." Santiago explained that pets already hear things at a much higher decibel than humans. "They don't know what that noise is," Santiago said. "They don't know what that explosion is." If you are going out on New Year's Eve, Santiago suggests keeping your pet in a room without windows, and to turn on the TV or music. "If you're home, keep them in a room with you," Santiago said. "Your presence calms them down considerably." But these holidays are still known to bring hundreds of pets into the shelter. Last year, the shelter saw more than 200 lost animals. That is why Santiago strongly advises to get your pet micro-chipped as soon as possible. "If we find a dog that has been running around loose and we scan for that microchip, we will drive them straight home," Santiago said. "They never set foot in the shelter. It's the easiest way to get a dog home." Plus, the county shelter is closed on New Year's Day. So pet owners will have to wait until Wednesday to start searching the shelter for their lost pet.